Disconnect the stva lead wire coupler (1). Insert the needle pointed probes to the stp sensor coupler (between y/w and b/br wires). 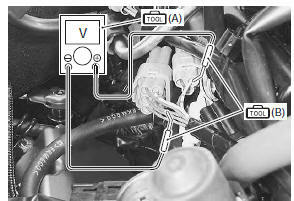 Close the secondary throttle valve by finger and measure the stp sensor output voltage. 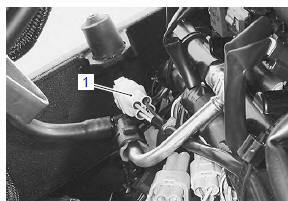 Move the throttle body upward by loosing the throttle body mounting screws. Loosen the stp sensor mounting screw using the special tool and adjust the stp sensor until the output voltage comes within the specified value. Tighten the stp sensor mounting screw to the specified torque.